The To Do list must be the most popular productivity tool on the planet. And it’s effective – ticking off jobs that have been done is as satisfying as a chip butty. You may think there is no room for improvement, but here are six steps to super-charging your To Do list, and your day! Review your goals and plans before writing your To Do list. No goals or plans? Well that’s your first job. If you don’t know where you are going, you can’t know how to get there. So anything on your To Do list will be just spinning wheels. You might feel busy, but you are not systematically moving towards your goals. Get an outline plan written, with measureable milestones. Phrase tasks as questions. Most people love solving problems and finding out if they can do things better. If you phrase tasks as a question, you immediately challenge yourself. Instead of writing “Write email to Henry” rephrase it to “How can I help Henry understand Tuesday's presentation?” You will write a better email, and be more engaged with your work. Define when something is done. Defining what we mean by “done” is often more complex than we think. Is the task to write the email, or is it to get Henry to add the necessary resources to do the project? By repeatedly asking what you mean by "done", you will have meaningful tasks, and jobs that actually get finished. Never carry a task forward more than 3 days. If it’s been on your To Do list longer than 3 days, there's a problem. Perhaps it is too big to be done right now, and needs more planning. Break it down into smaller tasks that can be done. Or it might not need doing at all, in which case stop cluttering up your To Do list. If neither apply, then for the love of God, just do it. Now. Review your To Do list at the end of the day. Ask yourself how effective your To Do list really was. Did it encourage you to think harder about your work? What got done and what didn’t get done, and why? Then write the following days To Do list before you finish up for the day. Stretch yourself, but don’t make your To Do list impossible. Stretch targets are fun and motivating. Impossibly long To Do list just don’t get taken seriously. 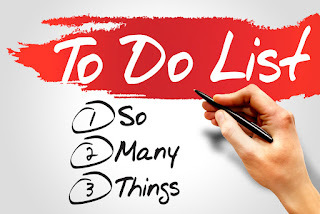 If your To Do list could not possibly get done by three of you, you are either carrying over too many of yesterday’s tasks, or not planning your work properly. See step one! What’s your top tip for a motivating and effective writing effective To Do list? Do tell! Thanks for Six Steps to a Better To Do List! It's nice!